This year's Best in Show Crufts winner was a Scottish Terrier Champion McVan's from Russia with love, or "Knopa" to her family. If you could say anything about this dog, apart from her good looks, it would be that she is extremely well traveled. A natvie Scottish breed, bred in the USA who lives in Russia and came all the way to England to compete in the world's biggest dog show. It is for Knopa that I write this post, about a Scotty in my archive who is perhaps one of the Champion's distant ancestors. 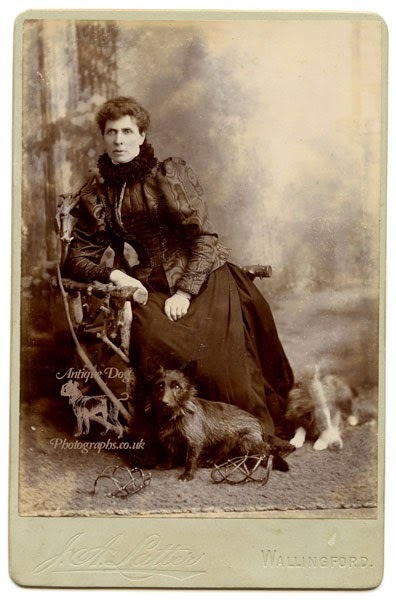 Over 100 years ago a well-to-do lady took her two beloved companions with her to the photographers studio to have their portrait taken. Once of these dogs, a Border Collie was unable to sit still for the duration of the photographic exposure, but the other dog, a Scotty, managed to stay perfectly still & alert for his big moment. 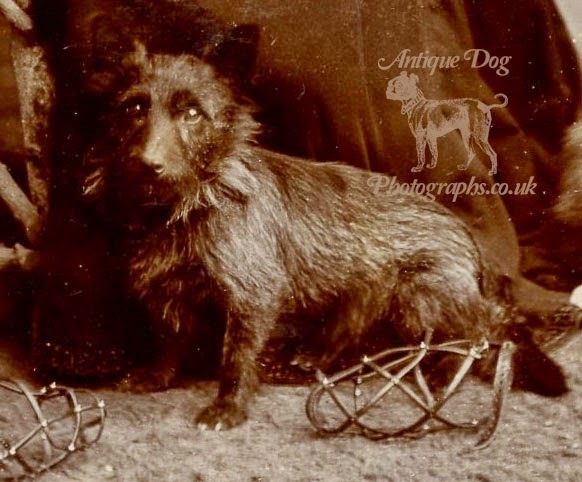 For the photograph the pair of dogs had their leather muzzles removed so their faces could be better seen. I have looked at this photograph many times and wondered why the muzzles were left in the foreground of the image. Perhaps the owner used them as a warning to the dogs that they would be put straight back on if they did not behave for the photographer! The photographer in question was J. A. Latter. He operated his Studio in St Mary's Road in Wallingford, Oxfordshire between 1899 & 1911 so we can date this photograph between those years. If we look at a photograph by Darren Staples taken of Knopa on her winning evening at Crufts and compare it to the 1900's Scotty, you can see how the breed has been developed and altered over the years. As with many dog breed's the exact origin of the Scottish terrier was the subject of much debate in the 1870's. As interest in dogs in general grew there was a need to classify individual varieties. 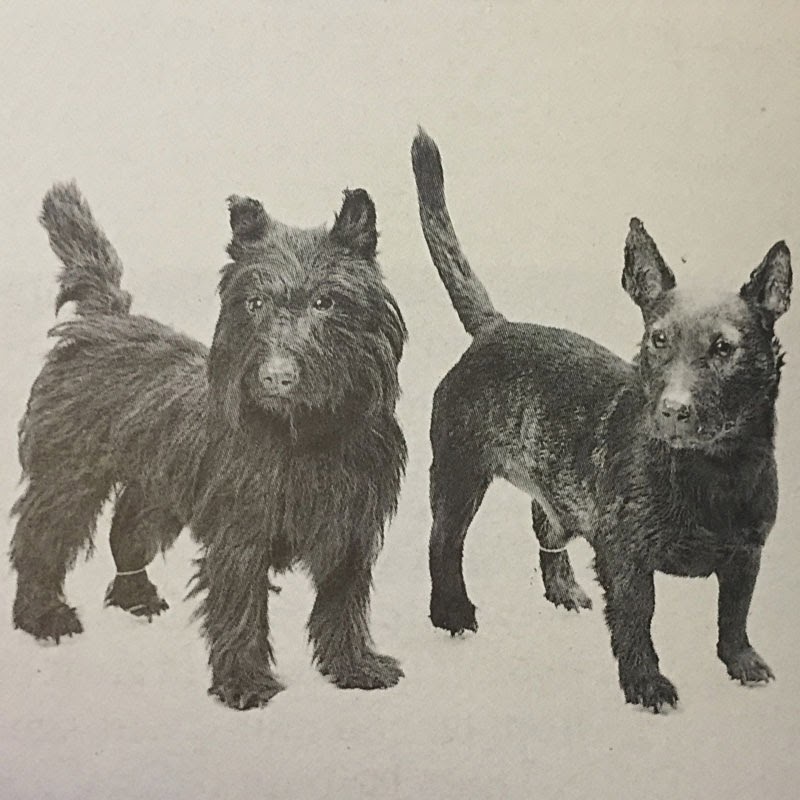 The Scotty of the early 1900's was of mixed heritage, descended from a number of different Scottish working terriers. There were two types of dogs in particular which were particular important to the development of the breed; the Aberdeen Terrier and the Highland Terrier. The British Museum holds within its natural history collections a specimen of each of these types which you can see below. The Aberdeen Terrier is on the left and was given to the museum by the Royal Veterinary College in 1900. The Highland Terrier has a much smoother coat and can be seen on the right. In 1890 the Kennel Club assumed overall control of pedigree registrations, and in 1892 The Scottish Terrier Club was formed and a breed standard was created for the Scottish Terrier. 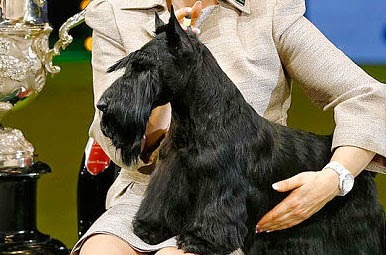 Having started this post with a Scottish Terrier successful at a dog-show, I'll end with another. 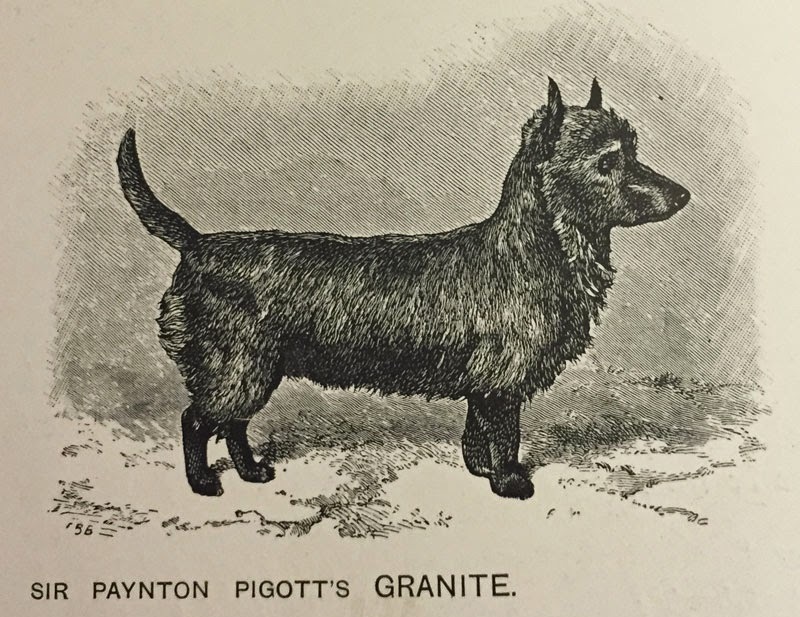 Here is an engraving of "Granite" the first ever Scottish Terrier to be shown at a Kennel Club Show.